8/28/2009Share this story on Facebook! 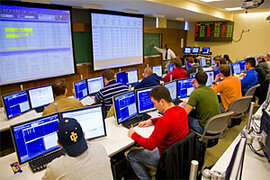 Dedicated to the study of financial, currency, and commodity markets, the Center for Trading and Analysis of Financial Instruments (the trading room) provides students with a "hands-on" feel for exchange activities of financial and commodity instruments -- from the initiation of orders to the final phase of trade execution. The student Core Trading Consultants have been playing a central role in the day-to-day operations of IC's powerful trading room since its founding in 1995. 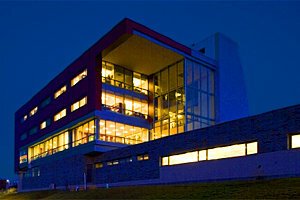 Consider IC's School of Business. Thanks to the construction of the new Park Center for Business and Sustainable Enterprise, the CTC is able to gain real-world experience in the largest dedicated trading center of any undergraduate institution in the nation. “Using the trading room is definitely helping to prepare me for a job after college,” says member Will Reilly ’10. Members use the state-of-the-art trading room, as students call it, to actively manage a publicly traded mutual fund with over $24,000 in real assets. The fund is composed of stocks in various industry sectors, and includes holdings such as Apple, McDonald’s, Google, and Ebay. “This was a very successful year for the CTC,” says Camila Neves ’11, the organization’s controller. “Even with the uncertainty in the stock market, we managed to outperform our benchmark by about nine percent.” The CTC compares its performance to the S&P 500, a common measure of overall market performance. The CTC also gives members the opportunity to invest on an individual basis. The Investment Challenge gives participants $100,000 of virtual money to invest in the stock market. Open to all students, the Investment Challenge lets students experience what real-life trading is like. Participants make trades and track investments using an interactive portfolio. At the end of the trading period, the three participants with the highest returns on their portfolios are announced as the winners. The organization also brings speakers to the school to discuss their experience and give members an idea of what a career in finance is like. Past speakers include individuals from firms such as Merrill Lynch and Broadpoint Capital. The group makes an annual networking trip to New York City, as well. There, members meet with alumni, visit financial firms, and participate in trading seminars for Thompson One, a piece of professional trading software used in the trading room. Most members would be in agreement that the CTC is not an organization to miss, regardless of your major.